There are several ways to cook Ahi yellow fin tuna, from grilling to barbecuing and from frying to baking. 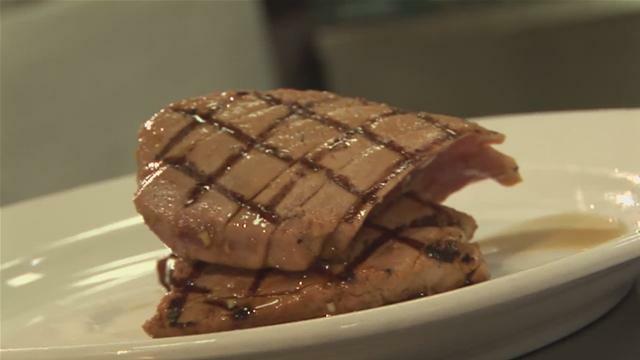 Whichever way you cook it though, the yellow fin tuna makes for an appetizing steak. Utensils: Grill, oven, stove, a shallow glass dish, measuring cups, measuring spoons, baking tray, serving tray. Prepare a marinade for your tuna steak by combining one cup of soy sauce and half cup of lemon juice in a shallow glass dish. Also add two cloves of crushed garlic and four tablespoons of extra virgin oil to this mixture. Season your marinade with sea salt, black and white pepper. Mix the ingredients well with a stirring spoon. Apply this marinade on both sides of the steak, so that it is completely covered and let it sit for 30 minutes. Preheat the grills by lightning the charcoal. Once the grills are ready to use, apply a small amount of vegetable oil on them to keep the steak from sticking. Place the marinated steak on the grill and let it cook for four minutes on each side. If you want a medium rare steak, reduce the grilling time to 2 ½ to 3 minutes per side. Heat your barbecue grills for a while. Pour enough olive oil or any other vegetable oil onto the marinated steak to coat it thoroughly. Place the steak on the barbecue grill and let it sear for 3 to 4 minutes. Flip it with the help of BBQ tongs and cook for another 3-4 minutes. Remove the steak from the grill and refrigerate it for about an hour. Make sure you do not cover the fish when placing it in the refrigerator. You can fry the fish fillet directly in the oil but it is recommended to cover it with breading, since it will help retain the juice and your end product will be a tender, succulent piece. Bread crumbs, flour or crushed corn flakes can all be used to cover the steak. Scour the fish fillet in all purpose flour, dip it in the egg and finally dredge it in the breading. Pour enough oil in a pan and heat it to 320 to 350 degrees Fahrenheit. Place the fillet in the hot oil and cook it for a few minutes, until the breading is golden brown. Remove the fish from the oil and place it on a paper towel to remove excess oil.